A sunlit lawn, blossom-laden trees, rustic chairs around tables laden with teapots and cakes, the tinkle of teacups and the murmur of conversation – what could be more British than a tea garden? As a nation obsessed with tea drinking and gardening, it is not surprising that the British combined the two. The popularity of tea gardens took hold in London in the eighteenth century, and grew during the Victorian and Edwardian eras, when suburban family parties joined cycling clubs and charabanc outings to sample tea gardens far and wide. Despite the British weather, tea gardens thrived for over two hundred years.Wonderfully illustrated with evocative contemporary images, this book charts the rise of tea gardens, their origins in earlier spa gardens, their distinctive style, their furnishings and accoutrements, their sad decline and triumphant return in the twenty-first century. 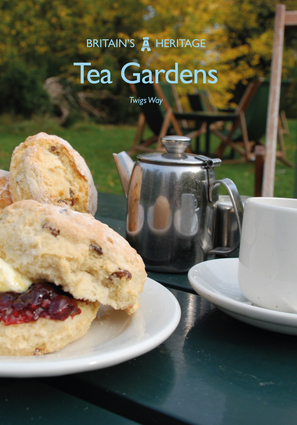 It also includes a list of tea gardens that can be visited today.This book is part of the Britain’s Heritage series, which provides definitive introductions to the riches of Britain’s past, and is the perfect way to get acquainted with tea gardens in all their variety. Twigs Way is a garden historian, writer and lecturer with a particular interest in the gardens of the working and middle classes. She is the author of a number of books including The Wartime Garden, Garden Gnomes and Allotments for Shire.